Local, state, and federal electeds are calling on DOT to make long-sought safety improvements in the West Village, including a protected bikeway on Seventh Avenue South. In a June 30 letter to DOT, City Council Member Corey Johnson, Manhattan Borough President Gale Brewer, Assembly Member Deborah Glick, State Senator Brad Hoylman, and U.S. Representative Jerrold Nadler asked DOT to act on street safety resolutions passed by Community Board 2 in 2014. 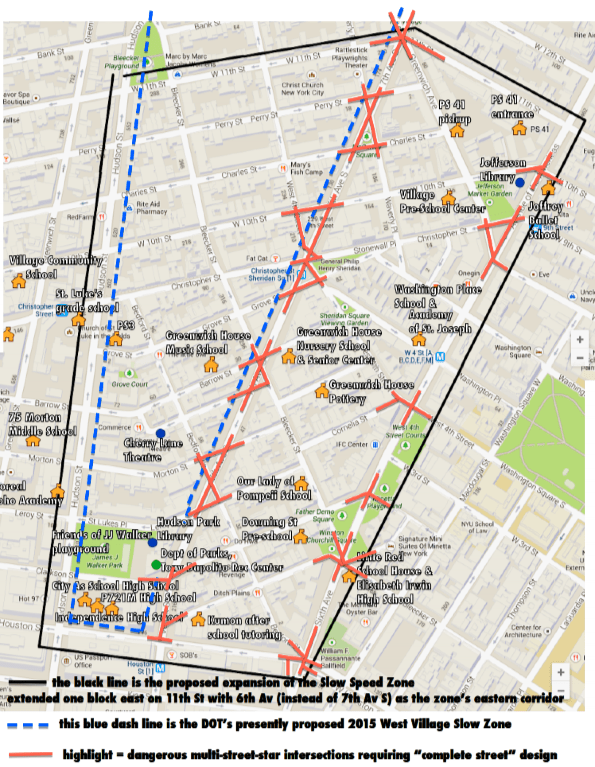 One of those resolutions requested that DOT expand the West Village Slow Zone, installed in 2015, east from Seventh Avenue to Sixth Avenue, with north-south boundaries at W. 11th Street and W. Houston Street. 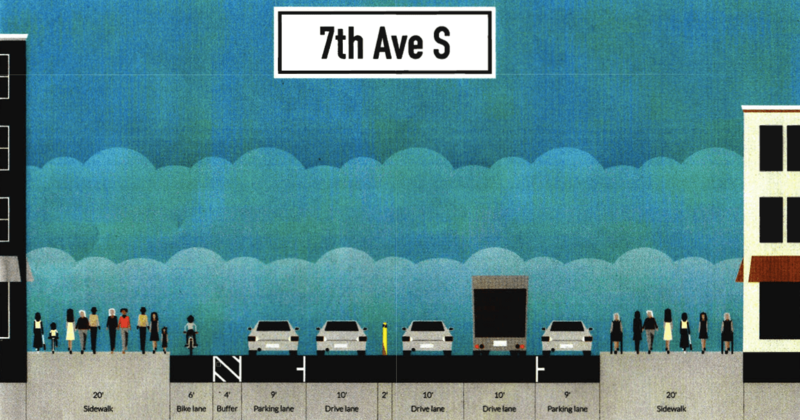 The other called for a redesign of Seventh Avenue South from Canal Street to W. 14th Street, including a protected bike lane, shorter crosswalks, and more pedestrian space [PDF]. The campaign for Seventh Avenue improvements is spearheaded by parents and staff at PS 41, which is located on W. 11th Street between Sixth and Seventh avenues. DOT rejected the Slow Zone expansion two years ago. Rather than redraw the boundaries of the zone, which had yet to be installed at that point, DOT said locals should request a second Slow Zone abutting the first one. DOT routinely receives more Slow Zone applications than it can handle and the approval and implementation process can take years. Seventh Avenue South cuts through the West Village street grid at an angle, and has many multi-legged intersections that see a lot of crashes. DOT made a few changes to the street last year, including a redesign where Seventh meets Christopher, West 4th, and Grove streets. At that time, Manhattan Borough Commissioner Margaret Forgione told DNAinfo DOT had “no plans” for further improvements. We’ve asked DOT for comment on the letter. Don’t worry, though! Polly Trottenberg has assured the City Council that her agency has all the money it needs to achieve Vision Zero. However, the real solution is to return the Village street grid back to what it was before 7th Ave South was brutally created in 1904 by demolishing thousands of homes and hundreds of businesses. There is no reason at all for the motor sewer of 7th Ave. South to exist at all. Return the street grid to the village and rebuild the thiusands of homes plus hundreds of business. Maybe it’s just easier politically to close off 7th temporarily as a “study”. Then when that heavy lift is done, ask the community what they want to do with that space. Slow Zone. That’s the ticket. city should just sell the lots using old Village Street Grid. Look at map, it’s obvious how ramming 7th Ave through the Village wrecked havoc with the fabric., obviously some details with existing storefronts on 7th but 12′ wide Mews could easily solve this. Use existing Village Low rise zoning and historic mumbo jumbo to insure new buildings fit seamlessly with existing. Might generated $3-5 billion just for the city just for the land. Plus the added economic activity would generate hundreds of million for city every year. Finally, even following the low rise Village style zoning – a couple of desperately needed housing units would be added. It’s a major win win all around. Just ban car traffic from the red stuff and your good. 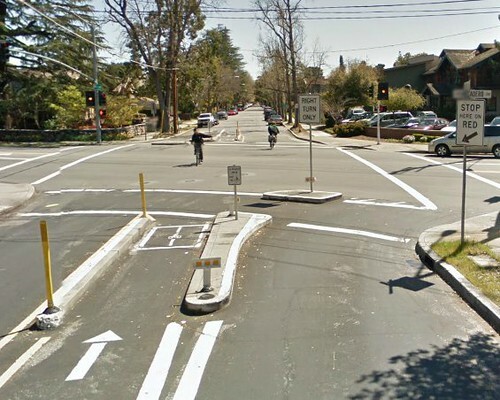 Lots of opportunity for eliminating or forcing turns to fix those complex intersections, but please allow people riding bicycles to continue to have full routing options just as pedestrians do. That’s not a solution at all. 7th Avenue South was originally built to provide a route for the 7th Avenue Subway to reach downtown and Brooklyn. Imagine the decrease in property values when you remove the street and in turn the subway to rebuild the homes and businesses that once were. The subway is too close to the surface to build over the street without removing the line or using prohibitively expensive foundation work and disrupting 123 service for years in the process. Calm the street, turn it into a park even, but returning the ROW to private individuals does not serve the Village’s interests. not true – the 7th Ave IRT Is certainly basically at the surface, but it’s easy to build 3-6 story buildings Over a fully functioning railway.